In true rugged device fashion, the Panasonic ToughPad FZ-G1 isn’t exactly a winner in the looks department, with a rather chunky plastic and rubber chassis. It provides a splash-proof cover – measuring in at 270 x 188 x 19mm – making Surface RT look super-thin in comparison. But the ToughPad FZ-G1 isn’t an aspirational lifestyle product like your standard tablet: this is a working machine, designed to go where frailer tablets wouldn’t dare. And if you or your business need rugged, relatively portable computing with the power of a full PC, this 10.1-inch slate could be just right for you. 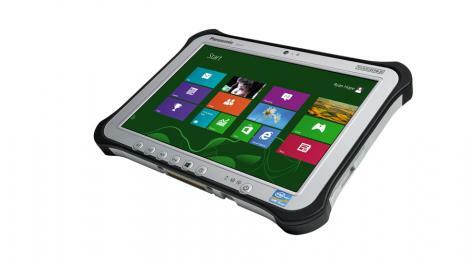 The ToughPad FZ-G1 comes running Windows 8 Pro – the same software you’ll find on desktops and laptops. This gives you Microsoft’s full operating system, which has been specially designed for touchscreen use. At 1.1kg, the ToughPad FZ-G1 isn’t as heavy as it looks, but its still feels substantial in the palm and you’ll probably find yourself gripping it with both hands if you don’t have a surface to rest it on. On the right, there’s a blocky port cover hiding a headphone jack, plus HDMI and USB 3.0 ports. On the left, there’s a clip for the stylus pen – which can be defaulted to act as a right mouse or customised to your choosing. Each corner is padded with a wedge of rubber, raised from the rest of the tablet, providing protection if the ToughPad FZ-G1 happens to slip from your grasp. In the bottom-left corner, a rubber flap conceals the charging port, which is reminiscent of one you’d find on a regular laptop. All this armour should protect the ToughPad FZ-G1 from the accidents of working life. Panasonic claims the ToughPad FZ-G1 can survive a drop of four metres, and though we couldn’t test this claim, the rugged feel of this tablet makes us inclined to agree. Seven large physical keys adorn the front of the ToughPad FZ-G1 just below the screen. These give you instant access to the home, volume, rotation, lock and power buttons, while the remaining two can be programmed according to your needs. Inside, Panasonic has stuffed in an Intel Core i5 processor and 4GB of RAM, which makes light work of Windows 8 Pro, booting up in a tidy six seconds. It runs smoothly and we were able to glide through the live tiles on the Start screen and drop in and out of desktop mode without any hassle. As the ToughPad FZ-G1 comes running the full-blown version of Windows, you get a complete internet browser in the form of IE 10 – allowing for a simple, straightforward web surfing experience, and with a (somewhat pricey) 3G option available, it’s great for those out in the field. Round the back you’ll find a removable 4400mAh battery, which is claimed to last up to eight hours – which you can get with careful usage. You can also swap it for a larger, bulkier pack if you want a longer lasting option. There’s a bunch of optional extras you can add to the ToughPad, with a slot on the top of the tablet giving you the choice of LAN, USB 2.0, microSD, GPS and True Serial. There are also 126GB and 256GB flash memory storage drives, a variety of processor speeds and the potential to have a rear-facing camera as well as the standard 1.3MP front facing snapper, which lets you customise your rugged tablet even further. The standard battery life makes this only just capable of lasting a working day, but the sturdy build and snappy insides mean the ToughPad is a hardwearing and hardworking option. Now why not read Windows 8 vs Windows RT: what’s the difference?